These black Bean Enchiladas are made with 3-ingredients for a quick flavorful and nutritious meal that you and your family can enjoy. All to often, we as parents, are busy juggling our schedules let alone our kids’ schedules. Times like these can sometime lead to last minute dinner decisions that may not always be in the best interest of your family especially when it comes to making unhealthy choices. For some, eating take-out may be the “best option” at the time because of convenience – it’s quick, easy, and accessible. If you find that this is becoming an on-going problem for you especially on busy weeknights, I strongly suggest that you challenge yourself to making dishes like these black Bean Enchiladas. This is an easy dish that’s super quick, uses minimal ingredients, and packed with protein and fiber. 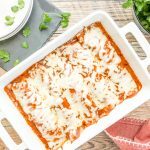 This is also a great make-ahead dish that you can easy make a day or two ahead and just pop it in the oven for a quick weeknight dinner option. The beauty of this dish is that it’s versatile. 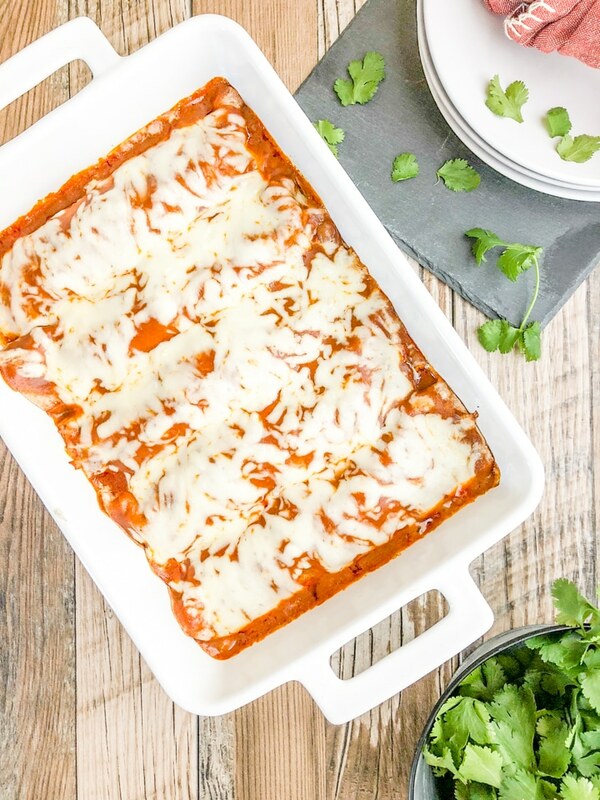 You can add protein of your choice for great chicken, beef or shrimp enchiladas. For added convenience, purchase a store bought rotisserie chicken from your local grocery store or Costco and chop it up to add to your bean enchiladas. Whether or not you add meat or make it strictly vegetarian, the end result is still great. Black beans: You can feel free to use canned or homemade black beans. For these black bean enchiladas, I used canned black beans that I drained before adding to the tortilla. If you would like to make homemade black beans the day before or the morning of I have a super simple Slow Cooked Black Beans recipe. Tortillas: I used whole wheat tortilla shells. If you use whole wheat tortilla shells, choose a really good brand. However, you can also use regular flour or even corn shells. Enchiladas: I used may favorite store bought enchilada sauce and “doctored” it up which I will detail in the recipe box below. It’s so good. Toppings: For added deliciousness, top with cilantro, a dollop of light sour cream, and/or sliced avocado. Black Beans are a high protein low fat food. They contain fiber and are rich in folic acid, magnesium, potassium, and iron. Black beans do not contain all of the essential amino acids that your body needs which is why it’s so important to eat and maintain a well balanced diet, so your body and its major organs will flourish to its full capacity. If you’re one who struggles with quick weeknight dinner ideas, I hope you challenge yourself to making more healthy and nutritious meals for your family like these black Bean Enchiladas. 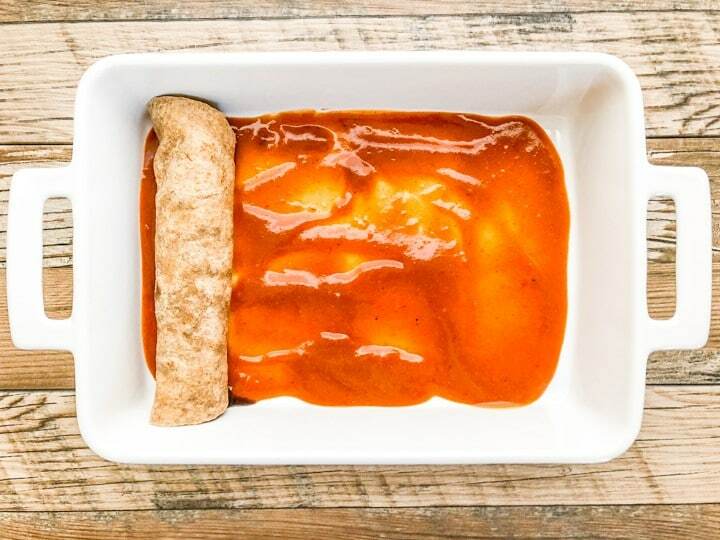 Bean Enchiladas - A simple yet delicious dinner idea stuffed with seasoned black beans, wrapped in a whole wheat tortilla and drenched in a delicious enchilada sauce topped with melted mozzarella cheese. Using a grater, grate about 2 cups of mozzarella cheese or cheese of your choice. Set aside. Using a skillet or griddle, warm tortillas just for a few minutes to make the shell pliable. Set aside. Place a saute pan over medium heat, add olive oil. When oil is hot, add flour to the pan and stir around mixing the oil and flour until the raw taste of the flour is cooked away. Allow the flour mixture to brown for a few minutes. Add the chicken broth and whisk until smooth, add the enchilada sauce and continue whisking. 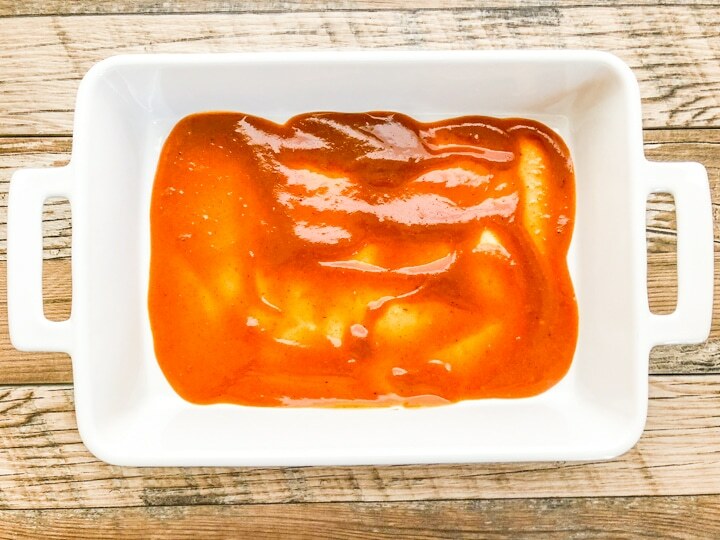 Feel free to add a little more enchilada sauce at a time until you reach your desired consistency. Set aside. 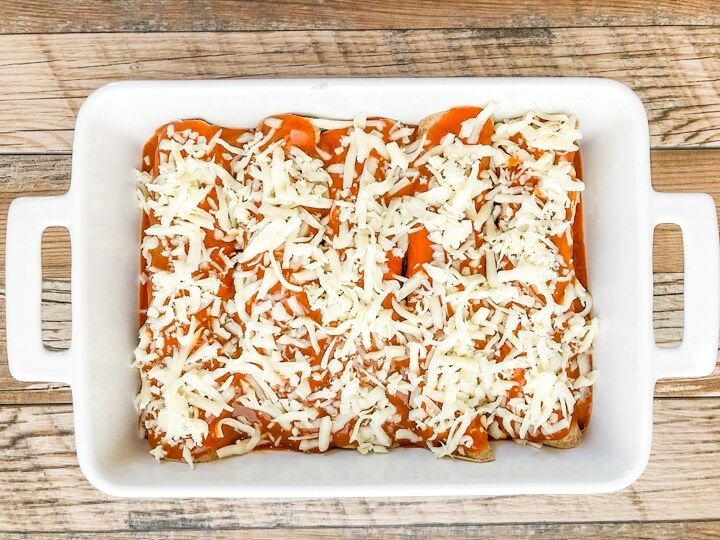 Prepare a baking dish, by spooning enough enchilada sauce from the saute pan, to cover the bottom of the baking dish. Using a separate plate, place a tortilla shell on the plate and add about 1/4 cup of black beans in the center of the tortilla and roll. Feel free to add-in other ingredients such as cilantro, sriracha if you like. Place in prepared baking dish. Garnish with cilantro leaves, plate and serve immediately. Feel free to double this recipe if necessary. 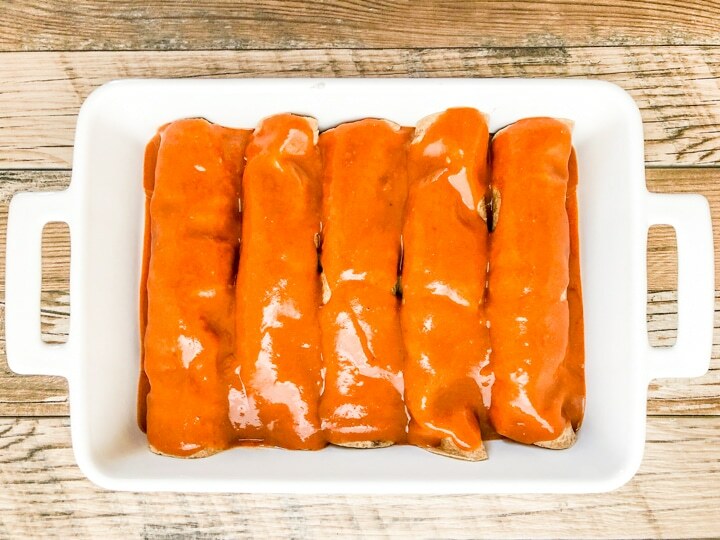 If you follow a vegetarian diet, you can doctor up canned enchilada sauce using vegetarian broth.